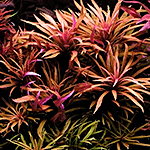 Cryptocoryne affinis 'Metallic Red' is one of the most popular Cryptocoryne because of its strong and bright colors. As its name suggests, this Cryptocoryne is characterized by its strong red color which starts out as green. The levels of red color will depend on the condition of the water. The more suited the leaves to the condition of the water, the better the color will turn out. Ammannia crassicaulis from Africa is also known as Nesaea crassicaulis. It is is a beautiful and highly recommended aquarium plant, although it has high demands for light. It has red-brown, cognac-coloured leaves. Stems becomes 30-50 cm and 8-15 cm wide and develop a reddish coloration under water. Grows best in soft and slightly acidic water. Make sure the lower leaves get sufficient light, otherwise they will die off. Easy to propagate by side shoots or cuttings, which can be cut off and planted in the bottom. 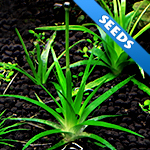 Ammannia crassicaulis, is distributed in swamps, rice paddies and rivulets of the African and Madagascan tropics. It is often confused with Ammannia gracilis, which indeed looks very similar, however, in the aquarium it has less intensively red hues, but is rather of a yellowish green to pale red. 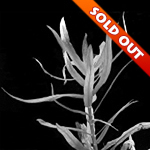 Most plants in trade that are sold under the name N. crassicaulis really are Ammannia gracilis. You will get 3 stems (grown emersed). Anubias sp. 'Snow White' is a rare aquatic plant that was cultivated by selective breeding. The spectacular white coloration is an uncommon result of a mutation that occurs. As the leaves age it increasingly becomes more green. Anubias sp. 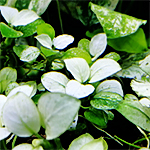 'Snow White' is an eye catching plant that makes a wonderful show piece in the aquarium. Note: This plant is not same as 'Pinto', it is smaller plant size of 'Petite'. 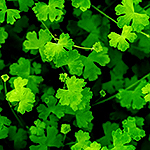 You will get plant with 5-6 leaves on the rhizome. 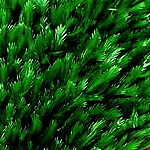 Fissidens grandifrons is a moss which is the largest of the family Fissidentaceae. It is found in turbulent water which it needs to get its carbon dioxide. Its fronds were held to be reminiscent of phoenix feathers by the Chinese. This moss should be tied with either cotton thread or a fishing line to the rock or wood. Fissidens grandifrons does not require strong light and CO2 injection to grow well, so it is a great addition for a shrimp aquarium. Each portion is 15 fronds. 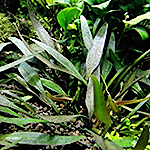 This Hygrophila was named after the Brazilian river Araguaia in trade, however, later on it was identified as the Asian species Hygrophila lancea. 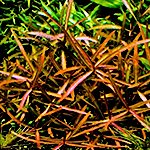 Under water it grows lineal reddish-brown leaves with a lighter-coloured central vein. Its stems have a creeping growth habit, ramify well and form low bushes. It needs a good CO2 supply. Trimming the leaves maintains the bushy form. Hygrophila lancea 'Araguaia' needs intensive lighting, and in contrast to most other Hygrophila species it is a rather slow grower. Usually it is sold in its emerged form and differs very much from the underwater form, which develops after it has been placed in the aquarium. This attractive moss has a very bushy growth habit, yet remains quite delicate. 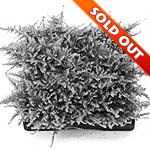 It resembles 'Christmas moss' very closely, but it is much more delicate and stays smaller. This moss develops dense, regularly ramifying shoots with almost rectangular lateral shoots. 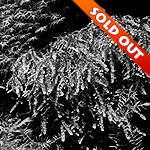 Mini Christmas moss attaches readily to rocks and driftwood and is thus ideal for accentuating hardscape materials. It can be used in many ways. 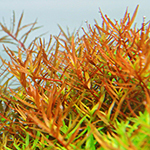 Mini Christmas moss is ideal for aquascaping, however, it can also be used in standard aquaria very well. Its fine, delicate structure makes the tank look larger, and thus you can play with proportions very well to create the illusion of a larger tank. Each portion is 4x4 cm on stainless steel wire mesh (safe for aquarium). Callicostella prabaktiana is a creeping moss with a wide distribution in the Asian tropics, where it grows on wet rocks and shaded riverbanks, among others. It resembles the species Callicostella papillata very much, however, it can be discerned from the latter by missing papillae (tiny bumps) on the leaf cells as well as a less serrate leaf margin in the tip area. It is often considered a variety of this species, though (C. papillata var. prabaktiana). The creeping, irregularly ramified shoots have a flat leaf pattern and look a bit like those of the Vesicularia species. However, C. prabaktiana can be discerned from the latter e.g. by a thick double midrib reaching almost to the leaf tip, rather roundish, thick-walled leaf cells and its tongue-shaped shortly acute leaf form. Callicostella prabaktiana may grow very slowly when cultivated submersed, however, it seems to be quite undemanding. Its growth habit makes this moss especially interesting as ephiphytical plant: its shoots nestle against the substrate and attach to it very tightly with their rhizoids. Loose shoots grow downwards, much like those of "Weeping Moss" (Vesicularia ferriei). Attached to rocks or driftwood with fishing line or something comparable, C. prabaktiana forms a dense "flowing" mat. Each portion is 5x5 cm. Eriocaulon sp. 'Vietnam' is not yet known for a long time in Europe, however it has already proved to be an easy aquarium plant - in contrast to a number of other Eriocaulon rarities in the aquarium hobby. This plant, not yet determined to species, was originally found in the Vietnamese province Thanh Hoa. It is a medium-sized, about 10-20 cm tall Eriocaulon with relatively broad, medium-green, arching leaves, resembling Eriocaulon sp. 'Goias'. 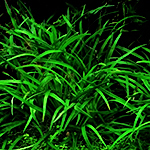 This grass-like plant still grows with medium lighting and is even said to be suitable for hard water. However, a nutrient-rich substrate and a not too low CO2 concentration in the water column (at least 20 mg/l) are surely very conducive for its growth. 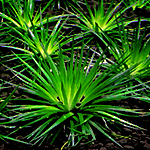 With time, this plant forms a dense "grass tussock" with a number of leaf rosettes and can be divided into several single plants for propagation. Eriocaulon sp. 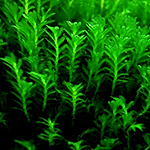 'Vietnam' can be used in aquascaping similarly to Blyxa japonica - e.g. as a meadow-like stand in the midground, linking the background with low groundcovers in the foreground, or as scattered tufts between hardscape elements. 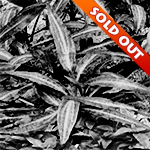 In contrast to similar rosette plants such as Sagittaria subulata or Helanthium bolivianum, it does not develop runners, making its handling easy. This undemanding Eriocaulon surely deserves a wide distribution in the aquarium hobby. You will get one plant.